One Book, one Philadelphia, and many curriculums. I’m happy to announce that my curriculum for the 2013 One Book, One Philadelphia selection has been published online by the Free Library. I also wrote a similar curriculum for the middle school companion title, Journey To Topaz. That book as been around for longer, so I also pointed towards the wealth of quality lesson plans which are already available around the web. 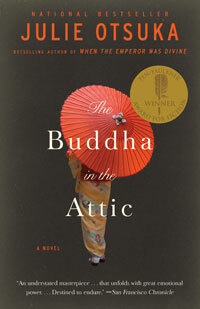 Lastly, if you haven’t gotten to it yet, I highly recommend The Buddha in the Attic. It’s not often that a book can be called “poetic” and “accessible” in the same breath. If you’re in the area, Julie Otsuka will also be speaking at the One Book Kickoff Jan 17th. This entry was posted in Unit Plan and tagged Buddha In The Attic, Julie Otsuka, Lesson Plans, Resources, Unit Plan on January 9, 2013 by lpahomov.